I am a planner by nature. I love to make plans– for trips, lunches, weekend getaways, even little things like life. Burning Man is a great exercise for someone like me. One of the 10 principles is “radical self reliance” and when the goal is a full week in the middle-of-nowhere desert of northern Nevada, at least one planner in the group is a necessity. 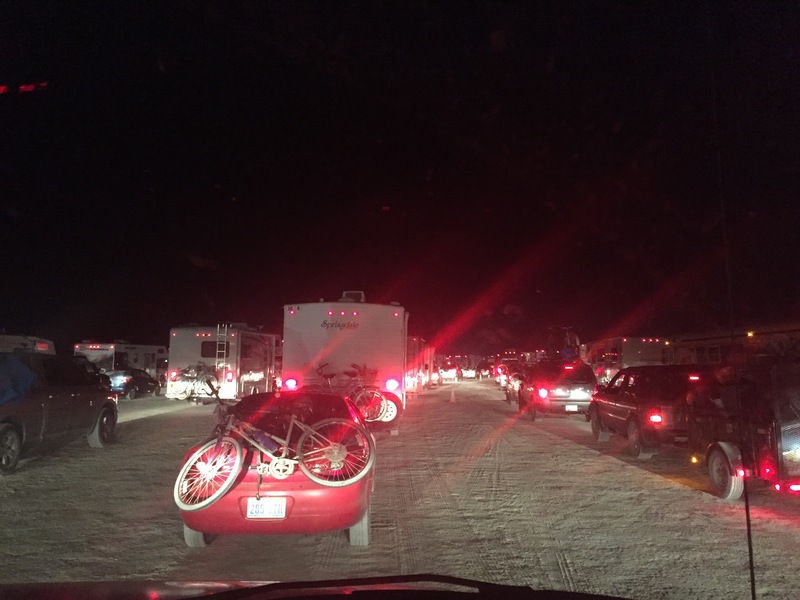 My friend/adventure accomplice and I were definitely well equipped for first timers, but if I’ve learned anything about life Burning Man, it’s that you can never prepare for everything. Our very long day started at Fisherman’s Wharf in San Francisco, where we picked up a jellyfish adorned campervan. The trafficky drive, past my beloved wine country, to Sacramento was uneventful. A quick stop at a friend’s for miscellaneous supplies and off to Walmart we went. Tasked with getting more food and supplies, the chaotic store– full of burners and completely picked over– created a high stress situation for this exhausted type-A person. We wanted nothing but to spend the last night of civilized luxury relaxing in our hotel with a bottle of wine, but were still frantically searching through big box store hell. Oh, the woes of BM prep. Finally, with enough items checked off the list to finish in the morning, we proceeded to the jellyfish to de-MOOP (MOOP = matter out of place) our wares before heading to our riverside hotel oasis. Perhaps the most important of the 10 principles is to “leave no trace” on the playa. You pack out what you pack in, so it behooves you to minimize any unneeded packaging (aka potential MOOP) prior to setting off. I plugged the address into waze in hopes of taking the fastest route possible. As soon as we pulled out of the burner-laden parking lot, I was directed into what appeared to be a construction zone. Much to my dismay, it was not a work zone, but a sobriety check! Now, bear in mind that we were both completely sober and not carrying 1 illegal item. That being said, WE WERE DRIVING A JELLYFISH VAN! A jellyfish van bearing no mark of the rental company. I was my normal no-nonsense self with the cop, but despite breaking no laws, was shaking slightly just knowing they could pull us over and search ol’ jelly (who was completely packed), further delaying aforementioned luxury and WINE. The Police officer seemed to stare into my soul while questioning me, though he must’ve been satisfied with that, and my answers, because he let us move along. We made it to the Westin, but not without making a spectacle of ourselves by driving into the entry circle from the wrong side. Before you judge my driving, let me assure you that their circle is backwards and you enter from the left versus the right. Picture this: it’s approximately 9 pm on a Saturday night, at a hotel that shares its space with a popular restaurant. We pulled up the wrong way, had no room to turn around, and paraded past all the fancy patrons who had come to enjoy their dinner on the river… with 1 jellyfish van and 2 incredibly weary travelers. We had a laugh with the bellmen and got ourselves checked in to our small slice of heaven. Fast forward through our lovely night of room service, champagne, amazingly comfy beds, and our last hot showers for A WEEK. 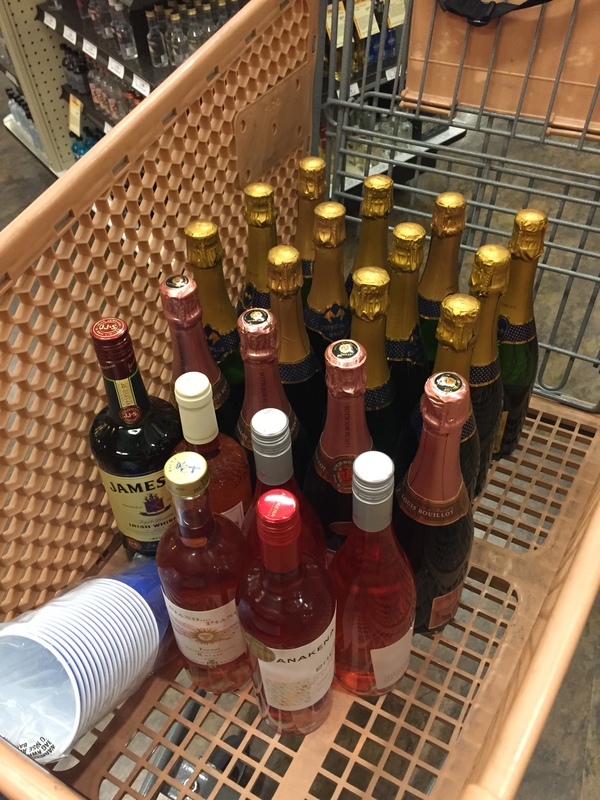 The following morning we were able to find the rest of our needed items and stock up on wine and whiskey. Hitting the road at 1:15, we hoped to arrive in Black Rock City by 6 or 7 pm. The primary goal was to reach camp before dark. 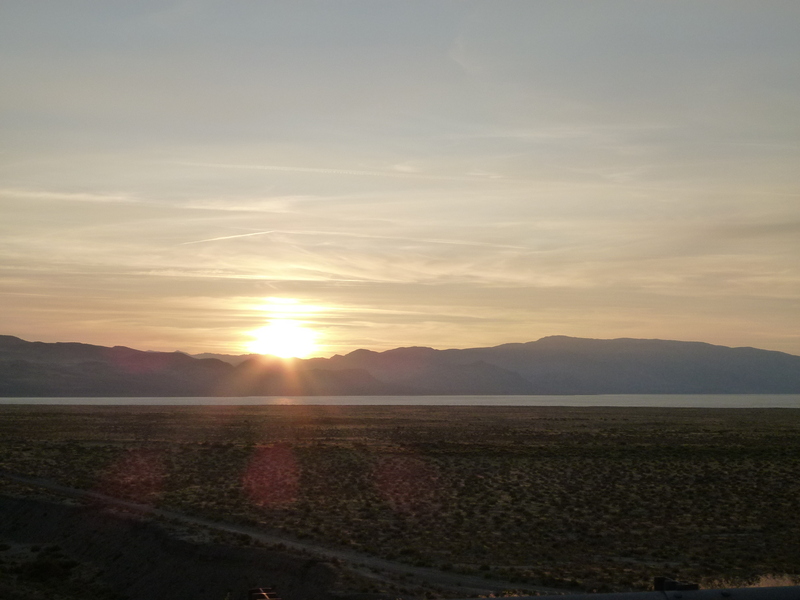 We made great time from Sacramento to Reno and our excitement heightened as we exited the highway onto Nevada State Route 447, a 2 lane road through Indian reservations, unbelievably rural “towns”, a whole lotta nothin’, and past Pyramid Lake. Before reaching any of that, we stopped at the first gas station to buy bike lights, a BM necessity for nighttime riding. 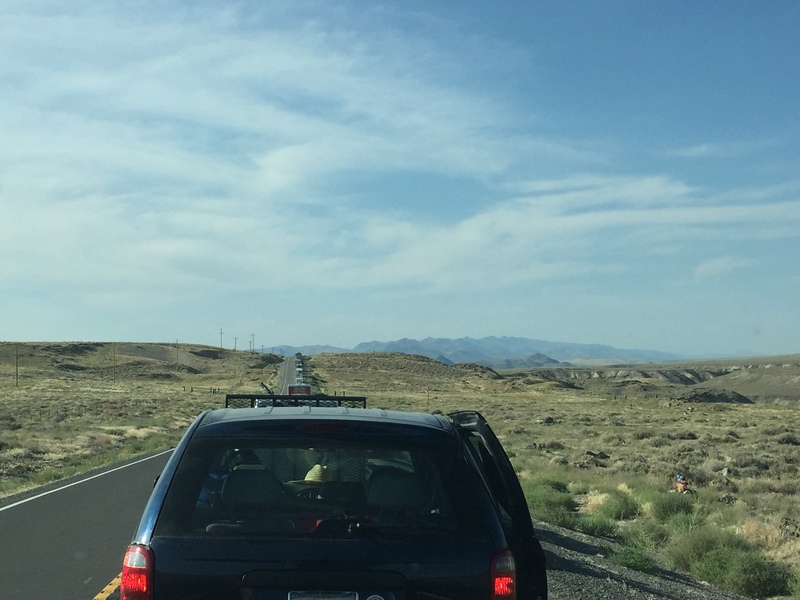 Since it’s essential you get gas before going to Black Rock City, in the event you run into massive traffic jams during exodus, we got in line. After perusing nearby gas prices (without looking too closely) on my trusty phone, we figured gas may be cheaper in the next “town”. Just a few miles down the road, the traffic seemed to build a bit. With Nixon, Nevada on the GPS, we planned to fuel up as we passed through. Mobile service was spotty when we came upon a store with a lot of activity and, of course, a line. We kept right on going towards Nixon. A couple of slow miles down the road, we regained GPS signal and realized that store/town was Nixon, and the only gas station for more than 50 miles. After some deliberation, and slowing traffic, we figured the best idea was to turn around. 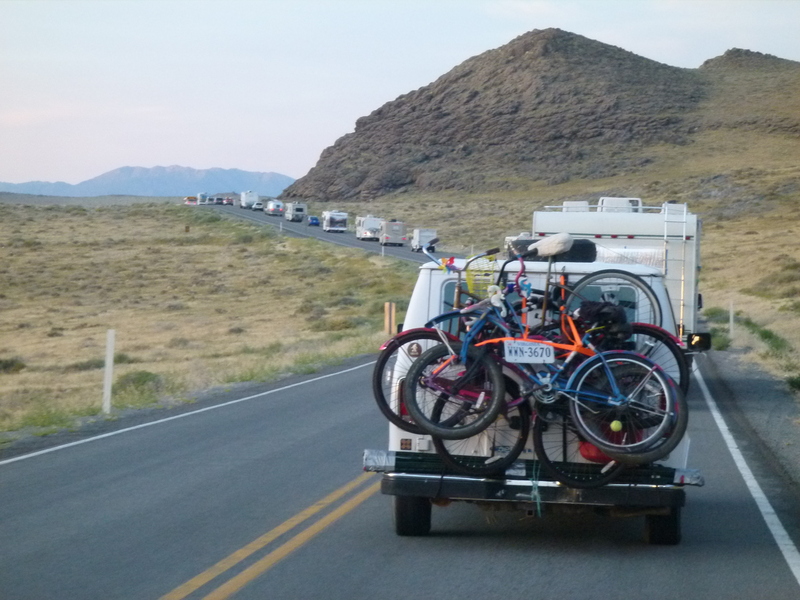 my dreams of arriving in Black Rock City before dark were dashed. The routine of driving a few miles and then stopping for at least an hour hit an all-time high of THREE HOURS at one point. Both of us tried to sleep. Both of us got out to meet our car neighbors. Both of us had to pee on the side of the road. As the hours droned on, and sleep eluded us, my throat (which always betrays me when I get worn out) grew more and more sore. With each stop, we talked about how much we’d like to celebrate our first Burning Man with a bottle of champagne. A few cars around us were well into their celebrations, but my research told me that local law enforcement is NOT very pro-burner, so we opted to leave all booze tucked away and just keep truckin’ (thanks Jerry). FINALLY , we arrived at the gate around 2 am and were greeted by… another line. All those brake lights indicated another 2 hours of waiting. We began to feel the dust infiltrate our lungs as our dreams of champagne shifted to just being horizontal in a bed. Once we made it past the ticket taker and van search, we were in line to be formally greeted. As is BM tradition, virgin burners are forced asked to get out of the car and roll around in the dust. We unenthusiastically obliged and were soon off to find our camp in the 9 o’clock plaza, at the rapid pace of 5 mph– the BRC, strictly enforced speed limit. We found our new home easily and wedged the van into a corner of the slumbering camp before setting off for the porta-potties… at 4:30 AM!!! Now, I grew up showing horses and in barns. I have peed in porta-potties, horse trailers, horse stalls, the side of the road, the side of a ski slope, you name it. With this in mind, I feel quite confident when I say that there is no more disgusting toilet than those at Burning Man in the middle of the night. On our walk back to camp, my mind was moving a million miles a minute, trying to sort out how on earth I could stomach those johns for an entire week, let alone survive on camping food. Here’s where xanax comes in handy–it quiets the mind to allow for sleep. It was only 8:30. My throat was so sore I could hardly swallow and I was so tired I felt more Walking Dead than Burning Man. Joy was not in my heart. Welcome to Black Rock City… it’s gonna be great! ← Drugs, drugs, and more drugs! Love it – I’m so coming with next year. I freaking love your posts! Thanks! This is my friend Elizabeth, right?